20 Amazing Pull Apart Desserts to make! I think the best foods are the ones that can be eaten effortlessly. Easy to chew, not too dry, no knives, and the fork or spoon should be optional. Am I being too subtle? I’m actually talking about pull apart desserts. The ones you can eat with your hands (what’s better than eating with your hands, right?). I don’t know about you, but I am a big fan of Spring and Summertime get togethers. Not that I don’t like them in the winter, it’s just that with the shorter days I tend to stay at home. When Springtime hits I am ready to spread the love, and by that I mean share all of my favorite desserts. Taking this “spreading the love” to the next level, we have pull apart desserts. There’s nothing more decadent than eating a soft and fluffy sweet treat with your hands. A pull apart dessert can come in many forms: rolls, bread, buns, brioche and I’m just getting started. The ingredients you can use can be just as varied. Starting with the classic chocolate that never fails, you could also add fruits, nuts, or pumpkin among other things. Honestly, what’s not to like about pull apart desserts? And who knew that there were so many of them!? One of my favorite things to bring to parties is a dessert, and these all would be amazing. Whether you’re a fan of chocolate, gluten free, fruit, or paleo, we have something on this list that is just for you. I’m sharing some of my favorite pull apart desserts with you today and if you decide to make any of these recipes I’m sure they’ll quickly become family favorites! 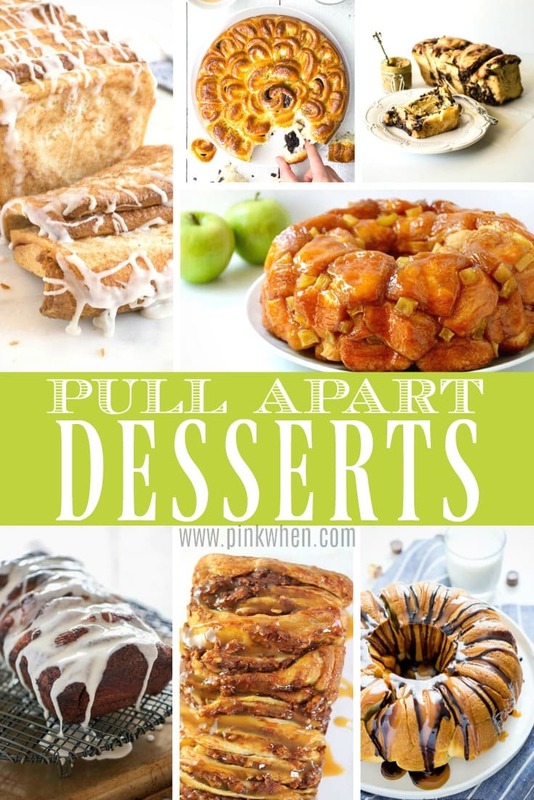 I hope you enjoy this list of pull apart desserts and find something that wets your palate. If you are looking for more desserts, you can find those here! Nothing like digging in with your fingers. I’ve had monkey bread, but had no idea there were so many other ways to use this concept. Yum! They are always so fun!